The recent outbreak of mumps back in May in New England got me thinking. When I was a child, some of my friends went through mumps, but I got lucky. I had chicken pox, but was spared mumps. Still, I wondered about them. How do you get mumps and what are they like? As a kid, I knew you got to stay home from school, but that’s about all I knew. And I didn’t know much more about them as an adult. I decided to get the facts about mumps and share them with you. Mumps is a highly contagious disease caused by a virus of the genus Rubulavirus. It’s not very common anymore since most children are immunized against it when they are young as part of their routine vaccination schedule. However, the vaccine isn’t foolproof, and mumps can still occur in children and in adults, as it did at Harvard University in Massachusetts and also at Sacred Heart University in Connecticut. Mumps has a bunch of symptoms, but the one most people recognize and remember is swelling of the salivary glands on the sides of the face. This swelling can leave you with a telltale “hamster-like” appearance. Other symptoms include fever, pain when swallowing, feeling tired and weak, joint pain, nausea and reduced appetite. 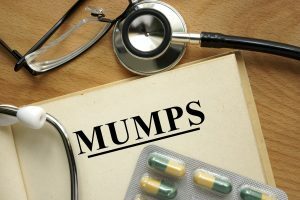 The mumps virus is spread from person to person through infected droplets of saliva or mucus from the mouth, nose or throat. Passing the virus can be done in several ways. These include sneezing or coughing, sharing eating utensils, sharing food or drink, kissing and touching a common surface after touching your nose or mouth. An infected person can spread the virus seven days before and for nine days after his or her symptoms start. People with the virus are most likely to spread it one to two days before and five days after symptoms begin. Since you can spread it before you realize you have it, it’s not hard to imagine how quickly an outbreak can occur. Diagnosis is pretty simple. The doctor will certainly suspect mumps if you have the “hamster face,” but he or she will still take your temperature and a history of all of your symptoms. He or she might take a blood sample to confirm the diagnosis or rule out other disorders as a cause of your symptoms. Because a virus causes mumps, antibiotics are useless; and right now, there are no antivirals used to treat it. Treatment is aimed at relieving symptoms until the virus can run its course and the body can develop immunity to it. This usually takes about two weeks. Getting plenty of rest is very important for a quick, complete recovery. Most doctors will advise drinking plenty of fluids, preferably water; using warm or cool (whichever feels better) compresses on your swollen glands; gargling with warm salt water; and taking over-the-counter pain medication for body aches, if needed. Eating a soft diet may also help if chewing or swallowing is painful. In rare cases, mumps can lead to complications. These occur more often in adults than in children and can include meningitis, inflammation of the membrane that covers the brain and spinal cord, or encephalitis, inflammation of the brain. The virus can also lead to inflammation of other organs and tissues, including the testicles, ovaries, breasts and pancreas. Common sense is your best armor in the fight against mumps. Don’t share plates or eating utensils with others, or share food or drinks. Cover your nose and mouth when coughing or sneezing. Wash your hands and common surfaces often. Keep some space when in close quarters with other people. Now that I know more about mumps, I feel blessed that I didn’t have to suffer as a kid like those friends of mine did. But I’m not totally out of the woods as an adult, and neither are you. The prevention measures for mumps also work for colds, flu and a slew of other illnesses, so be sensible and stay healthier.